When you read some articles about Erasmus, they may all seem to be… over glorified? Traveling, friendships, money, rainbows and unicorns. So, I decided to take the floor and try to introduce you to my point of view and every bright and dark aspect of this adventure. Are you ready? I’m not the best example of a well-organized person. I applied for my Erasmus 2 hours after having gotten the idea of actually going there, not knowing anything about the city. When I came to Ostrava for the first time in September, I was late for the welcome drink, but already… not in the best condition. When I was leaving Ostrava for the last time in June, I got late for my bus home and it went to Poland without me. But now I smile each time I recall it all and I don’t regret anything. This is how you make the memorable adventures of your life and these ones are not even the best. The first thing you might be afraid of is the paperwork you have to deal with. I counted it – to survive as an international student in Ostrava, you need at least 7 plastic cards – taken from home or made on the spot. And God knows how much time, paper and patience it takes to have everything done. But I can assure you – it’s all worth it. You won’t even remember after 2 weeks that you had to wait 3 hours in one office for one signature, yet the results will definitely make your life much easier. And every time you have a problem – ask, ask, ask! Those people behind the desk are there for you and I promise they don’t bite (even if they look like they would). So, you started the paperwork and I hope you thought it through better than I did. Now it’s time to plan your journey and pack. I’m not the best advisor here either – my 38-kg luggage and 4 transfers (including one party) on the 200 km way only speak for themselves. Please, be more responsible. I’m not proud to say that I spent the first week of Erasmus in my bed, full of regrets and missing home. All I needed was a spark of motivation to change it. And the Get to know each other weekend arrived. Little did I know that I was about to meet people who are going to change my life and become my dearest friends and family. I remember entering the bus, sitting among strangers, slowly starting conversations. I had no idea that these exact people will soon mean so much to me and the first beer we drank together in the bus will be the first of many. Amazing weekend full of fun and integration. Erasmus started to seem more promising. It all gets better when you have a good company. And believe me, everyone came to Erasmus with the same goal as you – to have fun, develop yourself and meet new interesting people. This is the group of the most open-minded and cheerful guys you will probably meet in your life – and you are one of them! After the weekend I had a gang to travel and party together. As the months were going by, we’ve become closer and formed a solid polish-estonian-french-greek-catalan-czech group, who has made the Erasmus time unforgettable. No one will count how many great adventures, parties and magic moments we’ve shared together. We have visited 6 countries in total and Czech Republic all around, sometimes in a mixed composition but always happy and ready for more. You can’t deny that the friendships and traveling really create the specific charm of Erasmus. It all wouldn’t be possible without another group of energetic, clever and hard-working people. Hats off to ESN Ostravská and all the effort they have put to make our Erasmus special. I had the pleasure to help them with organizing some events. It amazed me how much fun they were taking from it! All the events like climbing Lysá hora, pyjama party, walk a dog, flag parade, Christmas party and many more have brought closer together not only the incoming students but also the locals and made really unforgettable memories for everybody. Maybe you are afraid of the language barrier or lessons in a foreign language? Everybody was scared at first. I had a little different situation than others, because according to my field of studies I had all of the courses in Czech with native Czech students. At one point I even realized that I’m a Polish student learning Russian language in Czech Republic from Ukrainian professor. No doubts that it was hard sometimes, but the teachers turned out to be very supportive and understanding. I haven’t even noticed the moment I started enjoying the courses and the challenges they were giving. Living and studying among Czech students was a great opportunity to get to know their language and mentality in a way I could never do at home. 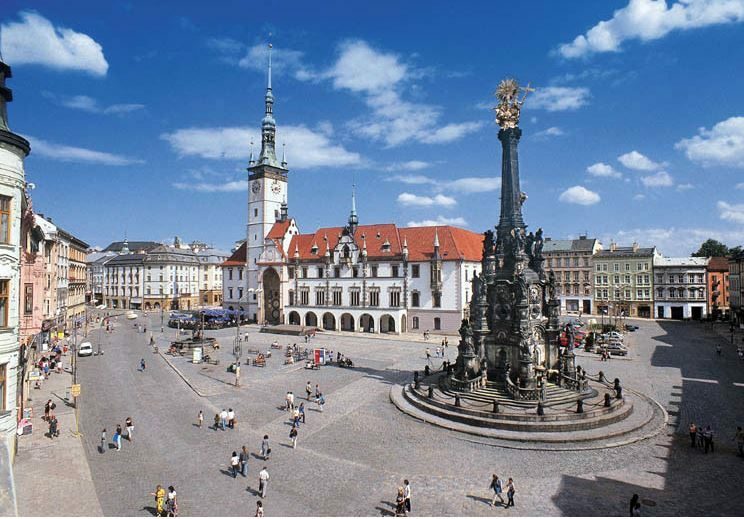 When I decided about going to Ostrava, I started reading about the city to find out more. I was very surprised when I saw the bad opinions: that Ostrava is a grey, ugly, industrial, boring city with chimneys and factories all around and it smells. Then I decided to start seeing good things in Ostrava. And I spotted a small cute main square (Masarykovo náměstí) with renovated, colorful buildings around. I spotted a big green park (Komenského sady) next to the Ostravice river, perfect for a walk. I spotted how the city is calm and quiet but full of life in the same time (I must mention the famous Stodolní street here). The truth is that everyone can find something for himself in Ostrava; just have the eyes and heart wide open. Don’t hesitate to try some new tastes too. You have to give a chance to the Czech cuisine and decide whether you like it or not. Personally, I enjoyed to grab a svíčková or smažený sýr with kofola from time to time, but if you ate it every day, you would end up with a heart attack. But I have to admit that nothing is very expensive in Ostrava. Trust me, beer is sometimes cheaper than water. So if you don’t plan on buying an expensive suit or losing your phone, you should definitely survive with your Erasmus money and afford some crazy travels and parties. So, I wanted to introduce you to also dark aspects of Erasmus. Okay, it seems like it didn’t work out. It’s extremely hard to say something negative about the best period in your life. But what’s the most amazing is that Erasmus doesn’t end with your departure. The friendships we have made, the places we have seen and the adventures we have experienced will stay with us forever. Once Erasmus, always Erasmus!